Painted by Anson Dwyer from the description provided by our great mystic J.S.M. Ward in 1930. A casual study of archaeology will reveal that the oldest kind of worship seems to be based around the idea of the Motherhood of God, and in most parts of the world Matriarchal religion, with its emphasis on Fertility, seems to have predated Patriarchal religion, with its emphasis on brutal blood sacrifices. The beliefs of the Old Testament Jews must be included among the latter, but even so, Abraham’s contact with matriarchal Ur of the Chaldees ensured that some idea of a Female Aspect of the Godhead survived at least until Christ’s day. In fact, history reveals that before the Coming of Christ almost all Religions acknowledged the Motherhood of God, or at least worshipped some Feminine Aspect of the Godhead. To both the Old Testament Jews and the Early Christians the Holy Spirit was the Mother Aspect of the Godhead, and in fact until at least the fourth century A.D. Church Fathers still refer to the Holy Spirit as Feminine. This is especially true of those Fathers who wrote in Aramaic, the language of Our Lord, rather than those who wrote in Greek or Latin. 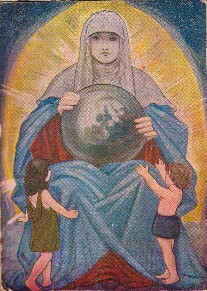 The reasons for the loss of this knowledge within Western Christianity are many and this is not the time to consider them in detail, but some of the disastrous results are only too obvious; the Roman Catholics have virtually elevated the Virgin Mary to a neo-Divine status in an effort to fill this lack, whilst many Protestant groups have responded by reducing women to total religious subservience. The word for `Spirit' is feminine, both in Hebrew and its later descendants, Aramaic and Syriac. By contrast, in Greek it is neuter gender, and in Latin, male gender. Western Christianity is historically descended from the Latin-using Roman Catholic Church, and consequently the Holy Spirit has generally been regarded as masculine in the West. This is less general among the Far Eastern Churches. Even in Greek, where the actual word is neuter, the symbol of the Holy Spirit, the dove, is feminine, and so the Greek-based Churches have always been more sympathetic to the idea, whilst the Syriac Church, from which our Liturgy is descended still uses Old Syriac in which the word for Spirit is feminine. This is but one reason that we too, see Her as the Female Aspect of the Trinity. Shekinah (from Hebrew `shkn' `to dwell' ) The term is used by Philo, but is not found in the Old Testament. It is equated with the "Divine Fire" or the "Glory of the Lord" and the latter term is found in the Old Testament (Exodus 16. 10, I Kings 8. 11) and clearly refers to the Spirit of the Lord. Wisdom. In later Hebrew literature this is often referred to as one of the attributes (Sephiroth) of God, and is personified by several writers, including Solomon (Prov. 4. 6-13, Prov. 8. 1-36) and Jesus Himself (Matthew 11: 19, Luke 7: 35) as Feminine. Despite the theological bias of almost all translators of the Bible into English, there are still many references in the Old and New Testaments that support the belief in the Femininity of the Holy Spirit. The basic philosophical concept of the Godhead, both in the Bible and elsewhere is that God is to be considered All in All, (I Cor 15, 28) or as the Revised Standard Version puts it "everything to everyone". If this concept is correct there must be a Feminine Aspect or Feminine Side of the Godhead. There are many references to Christ as the Only-begotten or First-begotten Son of God, both in the Bible and in other Christian literature. But unless the term "begotten" is used incorrectly in all these different places there must be a female Principal involved. One is begotten by one’s Father only when one is conceived by a Mother. Therefore every one of the above references telling us that Christ is the Begotten Son of God the Father also implies that He had a Divine Mother. He, the Word, was "In the Beginning with God," so we are not merely referring to Mary the human female who bore Him here on earth, but to a Female Divine Person who like the Father has existed from all Eternity. The Nicene Creed, which is accepted by almost all Christians today itself supports this belief, saying that Christ was "Begotten of His Father before all Worlds". The even earlier and equally authoritative Apostle’s Creed actually says that He was "Conceived by the Holy Ghost". Wisdom is Co-Eternal with the Father, and therefore Divine. In Proverbs 8; 22 – 30, She is quoted as saying ". . . The Lord possessed me in the beginning. . . . I was set up from everlasting, from the beginning, or ever the earth was. . . when He appointed the foundations of the earth then I was by Him as One brought up with Him. Wisdom is the Mother of All, including Christ, the First-begotten Son of God. In St Luke 7. 33-35 Christ said: "Whereunto then shall I liken the men of this generation. They are like unto children . . . For John the Baptist came. . . . and ye say ‘He hath a devil’. The Son of Man is come. . . . and ye say. . . . a friend of publicans and sinners! But Wisdom is justified of all Her children.